Samsung Shape Audio System review | What Hi-Fi? Samsung has proved time and again it can make a success of almost any product it turns its hand to. With the launch of the Shape Audio System, it can now add multi-room audio to that list. At the moment, the system is a reasonably humble one: comprising the Shape M5 and M7 speakers, along with the HW-750 soundbar. But Samsung has already announced the smaller M3 speaker, and we expect more will be on the way soon. The Samsung system is very attractive in its looks and as an overall package. It’s priced just below its Sonos equivalents - £230 for the M5 and £330 for the M7 - and arguably offers more features: Bluetooth with NFC connectivity (a one-to-one connection only), and DLNA certification on top of wi-fi playback. 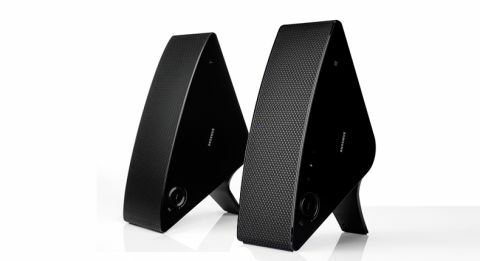 Some 2013-onwards Samsung TVs are compatible for wireless sound playback via Samsung’s TV SoundConnect feature, and you can also set up a surround-sound system using two speakers and a soundbar, à la Sonos. For multi-room, you must purchase Samsung’s wireless Hub (£50), which needs to be hardwired to your router via ethernet. Once this is hooked up, it’s a case of pressing the ‘speaker add’ button and switching on your speakers to register them onto your network. The Samsung multi-room app helps walk you through this, and is also the place you will control your music and speakers, choosing to control them independently or with others. The streaming services supported in the UK are: Rdio, Deezer, Spotify (via Spotify Connect), Napster, 8Tracks and TuneIn Radio, all of which (bar Spotify) are controlled by the Samsung app. You will also be able to plug in sources like NAS drives on the same home network, as well as playback music stored on your device. Playlists can be built within the app from the latter only; you’ll need to prepare any streaming-service playlists natively for the Samsung multi-room. The speakers feel solid and well built. The triangular design is stylish and understated. We found standing them up helps improve bass evenness, while also helping to disperse sound. Controls are minimal and touch sensitive, appearing in the form of three icons for source (internet radio, Bluetooth and TV SoundConnect), a volume dial and a mute button, though we never actually used them during testing – everything is just as easily controlled from your device. There’s no power button, but you will find the speakers go into sleep mode after around 25 minutes of inactivity, and can be woken up again by simply streaming music to them. File compatibility is extensive: MP3, WAV, WMA, AAC, AIFF, ALAC and FLAC (up to 16-bit/44.1kHz). High-res music is supported too – the speakers are able to offer playback of 24-bit/96kHz tracks and downscale anything above that. The five-star M5 remains our favourite of the two speakers, with a much better balance across the frequency range. Both offer a rich, full-bodied presentation, but the bass on the M7 tips too much onto the tubby side for our tastes. If you want a big, powerful sound, though, the M7 delivers, and the M5 does a good job for its size too. There’s a bit more agility in the M5 over its bigger sibling, and there’s a fun, energetic character to both of them. They jump into life when we stream Ella Eyre’s If I Go. The midrange is a strong point, sounding clear and open where rivals like the Panasonic ALL Series can sound closed in. This transparency means vocals are clear and packed with warmth, while instruments are expressive and dynamic. We still think the M5 pips the M7 when it comes to out-and-out detail, though. It’s a shame Samsung hasn’t been able to create a consistent sound across the speaker range. But, with the Shape Audio System, it has come close to providing Sonos with one of its first serious competitors in years. With extensive functionality, a well-designed app and easy set-up, all it needs is a ‘family sound’ and a few more speaker options. It’s not quite there just yet, but it’s not far off.